Can I Play my Spotify music on VLC Media Player? Spotify is one of the most popular streaming music services, which allows all the registers to access to more than 35 million songs for online listening and provides the option to download thousands of playlists for Spotify premium members. VLC (VideoLAN) is a free and open-source media player for Microsoft Windows, Linux, macOS, iOS and Android users. It is capable of playing any every audio file, various video files, and even DVD movies. It is the most stable, flexible and lightweight media player, which enables you to play video or music files in just about any format. Generally, VLC is an ideal media player for your needs. However, when you try to move music from Spotify to VLC, you will find Spotify files can't be recognized by VLC Player. So is it possible to import Spotify Music to VLC Media Player for playback? Why We Can't Import Spotify Songs to VLC Player Directly? On one hand, Spotify Free users can't save songs to their devices. And if you have a Spotify Premium subscription, you will be able to stream and keep music from Spotify for offline playing. But what you need to pay attention to is that you can only sync Spotify content to the limited devices. And all the content can be played within Spotify application. On the other hand, Spotify Music offers the DRM protected Ogg Vorbis files. And VLC Media Converter can only support MP3, AAC, FLAC, AMR, Vorbis, WMA, Speex and other common Audio Codecs. So in this case, VLC player is not compatible with Spotify Music. To play Spotify Music with VLC Media Player, at first you need to remove DRM from Spotify Music. The smart Spotify DRM Removal tool we are highly recommended here is TunePat Spotify Converter. TunePat Spotify Converter is a multifunctional Spotify audio conversion program. With it, you can not only completely get rid of DRM from Spotify songs, but also easily convert Spotify music to VLC supported audio formats, such as MP3, AAC, and FLAC. 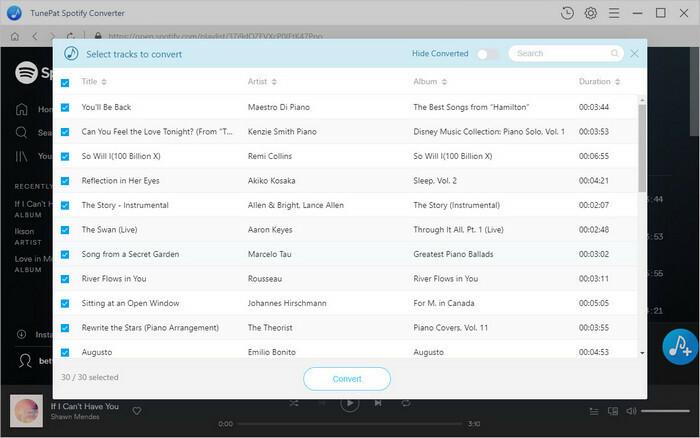 In other words, you can get common audio files like MP3 from Spotify with TunePat Spotify Converter, no matter you are using Spotify Free or Premium. Besides, with the Spotify web player built-in, you don't have to install the Spotify app separately. Just log in your Spotify account, you will find the download Spotify songs can easily be obtained. 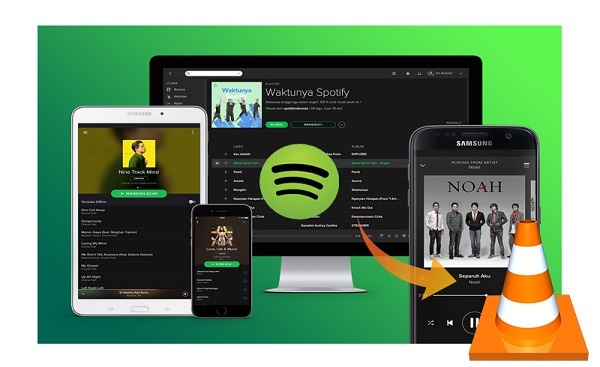 Now you'll see how to use TunePat Spotify Converter to remove DRM and convert Spotify Music to MP3 so that you can play the converted Spotify songs on VLC Media Player even if you are using the free account of Spotify. First of all, download and install the latest version of TunePat on your computer. 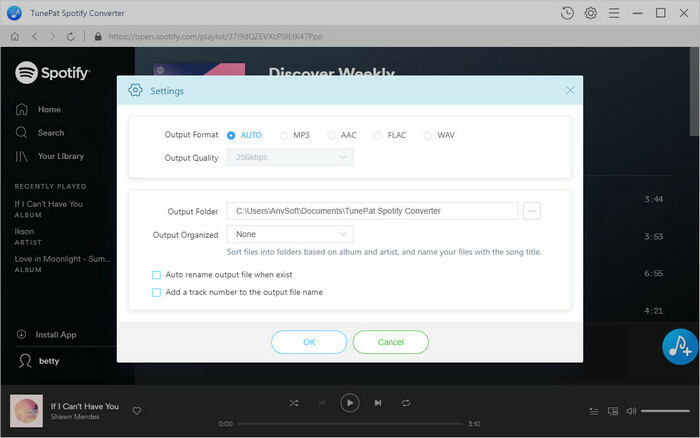 After launching the TunePat Spotify Converter on your computer, and you will see the simple user interface. Then you can click LOG IN button to log in with your Spotify account. You can click the settings icon on the toolbar to choose the output format for VLC player. TunePat supports multiple output formats, including MP3, AAC, WAV and FLAC, here you can select MP3 as output format. Because MP3 is the most common audio format used in almost media devices. Moreover, you can also choose Output quality, Output Folder, Output Organized by Album or Artist as you like. 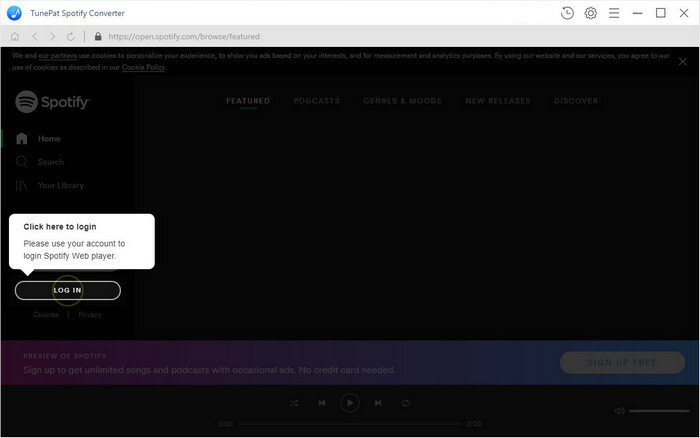 You can browse the Spotify to find any playlist, Album or Artist, and then click the Add button, the songs will automatically appear on the toolbar. Select the songs you want to play in VLC. 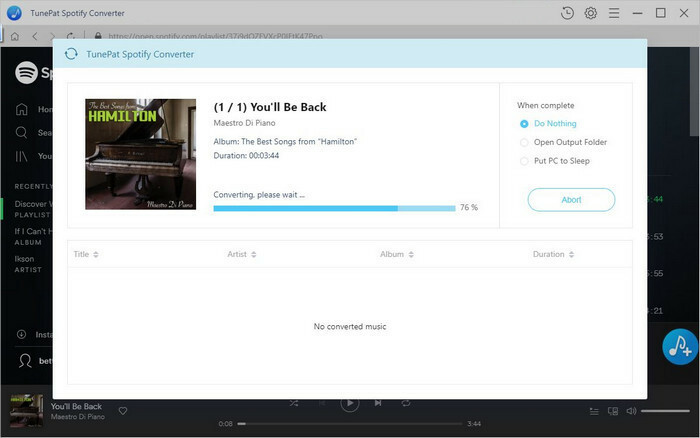 Click Convert button and TunePat will start to remove DRM from Spotify Music and convert those Spotify songs to VLC compatible audio formats at up to 10X faster speed. When the conversion is completed, you can find the converted Spotify songs in the Output Folder. You can click Open File or Open Folder to import the converted Spotify songs to VLC for playback. Alternatively, you can drag and drop the converted Spotify songs to the VLC Media Player. After Spotify songs being listed in the VLC player panel, now you can enjoy your Spotify songs without any limitations.